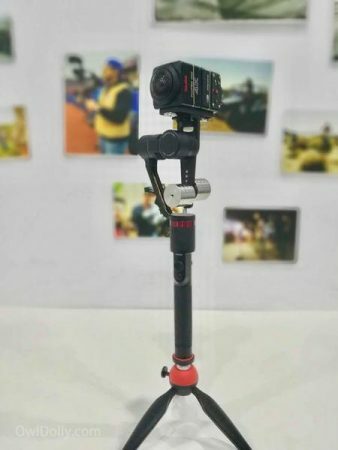 The Guru 360, the first 360 gimbal for consumers (previewed here), now includes an adapter that makes it compatible with the Kodak SP360 4k Dual Pro. They also posted a video that shows it CAN be used upside down. 360 videos need to have a level horizon in order to keep the viewer comfortable. One of the most effective ways to keep the horizon level when the camera is moving is by using a 3-axis gimbal. However, most 3-axis gimbals have motors that block the view of a 360 camera. The Guru 360 is the first 3-axis gimbal designed for 360 cameras that is affordable for consumers (gimbals such as the . 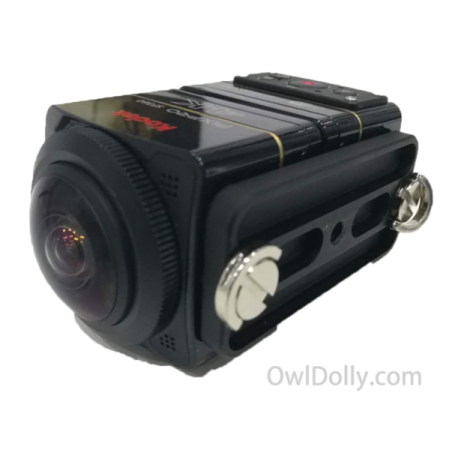 I had the chance to try a preproduction version that worked very well with 360 cameras such as the Nikon Keymission 360, Samsung Gear 360 and other small 360 cameras. Check out this sample video (with the Insta360 Nano). I tried the preproduction version of the Guru 360 with the Kodak SP360 4k Dual Pro (with the Dual Pro bracket and Kodak’s GoPro-style to 1/4-20 adapter) and the preproduction version of the Guru 360 couldn’t handle it. If you moved too much, the Guru 360’s motor would give up. The new adapter for the SP360 4k is included with the Guru 360 at no additional cost. As you can see, the video also shows that the release version of the Guru 360 *can* be used upside down BUT they are NOT claiming that it can be used with a drone. It *may* be possible to use it with drones! (although I haven’t tried myself). Update on Hubblo, the most affordable 3D 360 camera with realtime stitching, plus a video editing contest to win a Hubblo camera!